CLEARED: Team Sky's Chris Froome. Picture: Adam Davy/PA. 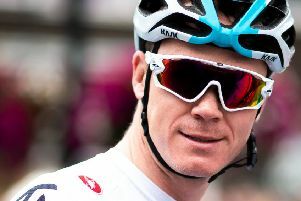 Although Froome’s sample was reported to contain a concentration of salbutamol in excess of 1000ng/ml, the UCI said it had closed the case base based on World Anti-Doping Agency (WADA) advice pertaining to permitted use. I understand the history of this great sport - good and bad. I have always taken my leadership position very seriously and I always do things the right way. The UCI added: “The UCI has considered all the relevant evidence in detail (in consultation with its own experts and experts from WADA). “On 28 June 2018, WADA informed the UCI that it would accept, based on the specific facts of the case, that Mr Froome’s sample results do not constitute an AAF [adverse analytical finding]. In a statement released via Team Sky, Froome said: “I am very pleased that the UCI has exonerated me. “While this decision is obviously a big deal for me and the team, it’s also an important moment for cycling. “I understand the history of this great sport - good and bad. I have always taken my leadership position very seriously and I always do things the right way.